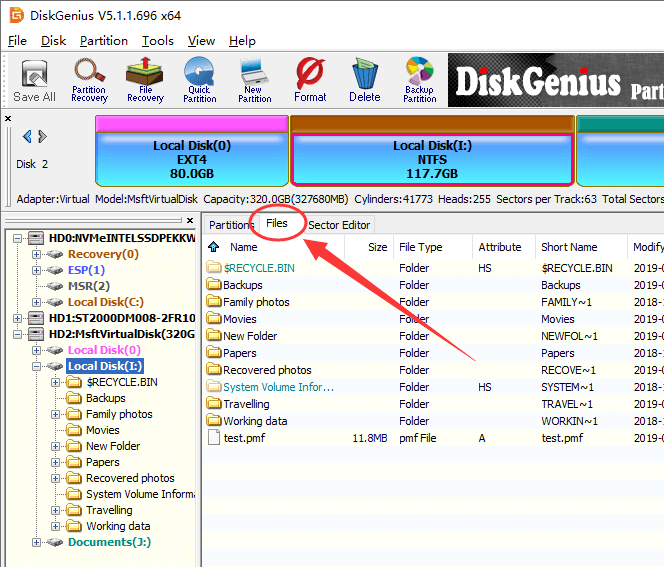 In this article, you can find out symptoms, causes and solutions to "The file or directory is corrupted and unreadable" error. Also you can learn how to recover lost data from corrupted or unreadable partitions. This error may happen to anyone, causing big trouble to users. You are no longer able to access data in the hard drive partition that whose file or directory is corrupted and unreadable. If you can't find an effective method to fix it, you'll end up with losing everything in this partition. Do not feel stressful if you are bothered by same issue. You are at the right place where you can find easy and efficient solutions. MFT or FAT corruption of partition? "I have a 1TH external hard drive purchased 2 years ago and it contains about 600GB data, most of which is backup copy. It is divided into three partitions used to store different data. I resized the second partition as it is running out of space but it took nearly an hour to completed 54%. The resizing was carried on my laptop which is not connected to power as I'd never thought the resizing should take that long. As the laptop batter won't last another hour and I had to move the laptop and external drive to study room for charging. When my laptop was well connected to power, I checked the resizing process which had stopped as the external drive had been disconnected from PC during the moving process. I reconnected the drive but failed to access the partition and got the message ‘H:\ is not accessible. The file or directory is corrupted and unreadable.' Moreover, the files system was RAW instead of NTFS." This error will occur if file, folder, MFT (Master File Table), FAT (File Allocation Table) or the USB drive gets damaged due to certain reasons. This error is common to many of us, and yet the causes remain unknown to most users. Let's see why this error happens. As to Windows users, the most frequently used file systems are NTFS and FAT. MFT means Master File Table and it is included in NTFS file system playing important part in file storage. All information about a file such as size, time, date and permissions is stored in MFT entries. When files are deleted from NTFS partition and MFT entries of these files are tagged as free and can be reused. File recovery software retrieves lost data by analyzing MFT information. Therefore, once MFT gets damaged then system won't be able to access data from the NTFS partitions. FAT partition is commonly used on flash drives like USB flash drive and SD card. At present, users are very familiar with FAT 32, FAT 16 and FAT12. FAT partition stores and manages data with the help of File Allocation Table (FAT) locating at the starting area of partition. Simply speaking, its main function is telling system where file is stored. Files are saved on discontinuous clusters; each cluster contains a pointer to the next cluster, so that system can read the all data of the file. Thus FAT error will lead to partition corruption. As the Internet user, you browse many sites every day for working, study or entertainment and you may download or install program to computer. Thus it's very likely that your computer can be infected with virus if you visit certain site containing virus or install unknown apps to computer. You know the harm of virus clearly. It can delete important files without informing you, damage operating system, corrupt partition information, etc. Moreover, it may infect other drive connected to your computer. Thus the installation anti-virus software on your PC doesn't mean your USB drives are free of virus, as they can be used on other PCs which are not well protected by anti-virus software. Once virus damages file system of the disk, the partition will turn to inaccessible and files on the drive are no longer available for common visit. And anti-virus program is not able to retrieve data from the disk even after virus is cleared. Therefore, update your anti-virus software in time and scan USB drive every time it is used on strange PCs. What's more, do not insert untrusted USB drive to your PC, for the drive may contain scared virus. USB drive or flash drive can be corrupted on account of bad sectors. Bad sector is a kind of sector on hard drive or flash memory which is no longer accessible or writeable due to permanent damage. Partition information such as file system usually saved on specific location. If the location includes bad sectors then operating system will not able to accessible data. Then you'll get error messages such as "The file or directory is corrupted or unreadable" or "Disk in drive X:\ is not formatted. Do you want to format it now?" The removable disk will risk losing vital files system information if you unplug a USB drive from computer while the drive is transferring or reading data. This is one of the most common reasons of the error. Most external disk can be unplugged safely by clicking the Safely Remove Hardware icon on the notification area, the right bottom corner of the screen. Make sure that system has done on saving or transferring data to the drive before ejecting it. If the USB device has a small light showing it is still in use, then wait a moment until light stops flashing. If files in the unreadable partition are not important to you, then formatting is the easiest solution. Formatting process configures hard disk with new file system, after which the old and corrupted file system will be replaced. The shortcoming of formatting is that it erases all existing data off the partition and affects file recovery result. Plug the external drive to computer and open Windows Explorer. Right click the disk and choose "Format" item. Choose file system format you need or just leave it as default setting and select "Quick Format". Then click "Start" to format the drive. Chkdsk (Chkdsk.exe) is a command-line tool offered by Windows to check and repair volume errors. This tool tries to repair any problem it finds out, for example, lost clusters, cross-linked files, directory errors, etc. Click "Start" button and click Run. Type in cmd to the open box and hit "Enter" key, then you'll get the Command Prompt. 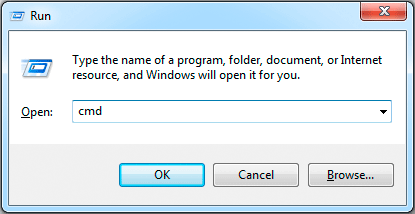 For Windows 7 and 8 user, you need to run the Command Prompt as administrator: click Start button and search for "Command", then right-click it and select "Run as administrator". Continue to type chkdsk /f g: and press Enter. G is the drive letter of the problem partition and it can be F or other letter on your computer. Type Y and hit Enter and restart computer to resume disk check if you get the message "Chkdsk cannot run because the volume is in use by another process. Would you like to schedule this volume to be checked the next time the system restarts? " It may takes a long to finish the process relying on the number of files and folders, disk speed, system resources, capacity of the volume. Chkdsk can't works as well as expected in some cases, and sometimes it may over-repair items, leading to difficulty for file recovery. Thus this tool is not suggested to fix error if you want to recover data. PartitionGuru is a versatile and useful tool which can recover data, manage partitions, backup system, check and repair bad sectors, etc. 1. Free download, install and launch PartitionGuru and you'll see tis main interface. All disk and partition information is clearly shown. 2. 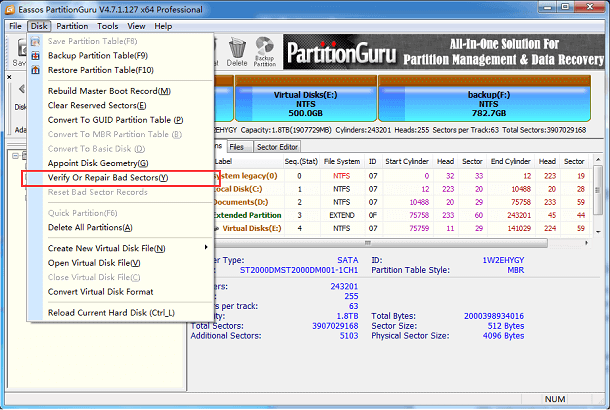 Select the unreadable partition and click menu "Disk". Click "Verify or Repair Bad Sectors" and the program starts to scan the partition. When it finishes scanning, it reports how many bad sectors on the drive and asks you whether to repair them or not. Still, if files on the partition mean too much to you, you should perform data recovery at once instead of repairing bad sectors. It's easy to recover data from partition whose file or directory is corrupted and unreadable. PartitionGuru is good option for hard drive or USB drive data recovery, as it provides specific function and algorithm to retrieve files and folders from damaged volumes. In some cases, PartitionGuru is able to display files and folders of corrupt partition directly without doing any scanning. Let's see how to recover files from inaccessible partition. Connect the hard drive in question to computer and launch PartitionGuru. If the device cannot be recognized by computer and PartitionGuru, please check whether it is properly connected or change a new cable. If file system of the corrupt partition is NTFS, you can try this solution: Select the drive which reports file or directory is corrupted and unreadable and select "Load Current Partition Intelligently" from Tools menu. 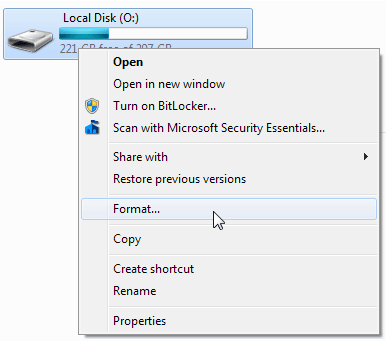 If the NTFS drive is not damaged that badly, files and folders will be displayed directly without any scanning actions. Then you can save files you want to recover to a specified location. Please note this feature does not apply to FAT partitions. If your files cannot be found in this way, please try step 3. 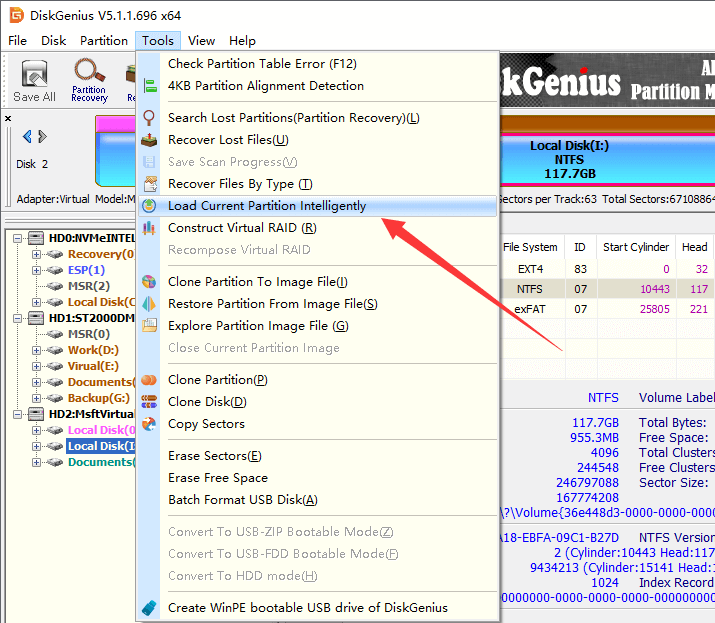 Select the corrupted partition and click "File Recovery" button from toolbar. You can see "Recover Files" window where you should select "Complete Recovery" and click "Start" button. Then PartitionGuru starts searching files from selected disk space. There are two recovery modes here: Recover Deleted Files Only and Complete Recovery. The former mode recovers files lost due to deletion, cut, empty Recycle Bin, etc. The latter is able to retrieve files from RAW, corrupt or formatted disks and partitions. The "Search For Known File Types" option is selected by default, which is responsible for deep scanning. You can click "Select File Types" button to specify file type for deep scanning. Once a file is selected, you can see a thumbnail preview on the lower part. If you double-click a file, you are able to view file content with original quality. File preview helps to make sure whether the file is correct or damaged. PartitionGuru supports previewing image files, documents, text file, audio & video files, etc. and the free trial version also includes this feature. To get files recovered, please select and right-click files you want to recover, and click "Copy To" to save them to another safe location. 1. If you can backup data in regular, then you won't be upset when getting the error message. Therefore, it's strongly advised to backup important files and keep more than more backup copy. 2. Do not perform formatting if the corrupted partition contains important data. File and partition recovery should be carried out first. 3. Take good care of your removable drives and local hard disks and protect them from being damaged or destroyed. 4. Update anti-virus to latest version and prevent files from being damaged by virus or malware. 5. Use the Safely Remove Hardware icon to eject USB drive instead before plugging from USB port. "I'd be very cautious initially, when often a boot error may account for drive access issues. Try using another OS drive to run, and access the problem drive from that to try salvaging data. Once stronger "repair and recover" methods are used, there's no going back." "I was has problem in windows and I made reset pc and I select remove all files by mistake , after that I recovery my tow partitions first partition working good and I was thing second partition will work same and I didn’t check and I installed my windows with new 2 partitions and after that I saw one partition work and another one can’t work and my problem can’t make recovery again because I made new partition with different size . Please help me "
"tried everything to no avail untill disk genius and it works perfectly clicked to reformat the empty drive with the error and it fixed the problem instantly also program downloaded in 10 seconds so good"
"I had connected my hard drive with TV. Played videos and slideshow, but after few days I got above issue, Might be because I had removed hard drive while video is playing. chkdsk /f D: command worked perfectly fine for me, it took around 15min to recover. Thank you so much But few folder wan't recovered. Its showing size 0 "
"Could not access one of my 2 TB portable hard drives. Corrupted, unreadable and inaccessible. I didn't care about the data as the disk was corrupted using Windows Format program. scndsk didn't work as it couldn't find the drive, so I downloaded PartionGuru. It worked like a charm! Found the disk, formatted it and I'm back in business. Highly recommend this program!" "OMG chkdsk actually worked! In only a few seconds! Thank you very much x"
"i tried doing chkdsk /f g: it says... The type of the file system is NTFS. Unable to determine volume version and state. CHKDSK aborted. please help me "
"u guys are great! thanks a lot"
"Hi... its not working for m i tried doing chkdsk /f h: or chkdsk /r h: when i do this im getting... The type of the file system is NTFS. Unable to determine volume version and state. CHKDSK aborted. please help me out in accessing my driver and ger back my data. thankyou. "